For decades, even centuries, individuals with disabilities have not only faced the daily challenge of their disability, but have experienced the stigma and discrimination from society. Although many individuals are made to feel like that are a minority, the statistics prove that individuals of all abilities make up our communities. Although societal views and treatment towards individuals with disabilities has improved, society as a whole must realize that individuals of types of disabilities have the same rights as everyone else, including but not limited to: education, employment, housing, health care, spirituality, sexuality, and basic human rights. What can you do? You can become an advocate or raise awareness by breaking down negative views and barriers that prevent individuals with disabilities from having the same rights as everyone else. You can join organizations that work one on one with disabled individuals and be part of the movement that works hard to ensure that health care reform legislation helps adults with disabilities or to expand the federal hate crimes law to protect individuals with disabilities. 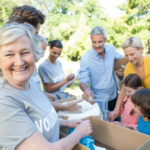 Volunteer Your Skills & Services: The senior citizen community is thriving and includes individuals of all abilities, including men and women who became disabled with age or were born with developmental or intellectual disabilities. They all deserve the same type of services that are offered to other senior citizens in your community. Whether someone needs yardwork done, a ride to the pharmacy or doctor’s appointments, or just some friendly conversation over a cup of coffee, there’s a lot you can offer to the aging & disabled community. Include Individuals with Disabilities in Your Activities: Many people with disabilities have a difficult time making friends in the community. For instance, individuals who live in a group home facility are taken on lots of outings like concerts, movies, and other fun activities, but it’s not always the ideal activity for really connecting with others. If you run an organization, a church group or even a leisurely sports team, why not make an effort to invite all members of your community? Another way to get connected is by volunteering, coaching, tutoring, or teaching for adaptive sport or education programs. However you decide to get involved, make sure that you are open minded, welcoming, and eager to learn about others; you may find you have a lot to learn and a lot in common.